You know that you lost your phone somewhere in your house. You would try calling your own number, but you had your phone set to Vibrate Only mode. Remote Ring: By sending a text to your phone with the “right” code that you preprogrammed when you set up this service, your phone will ring on its loudest setting, even if you have the ringer set to Vibrate Only. If you know that your phone is in your house, the accuracy of GPS isn’t savvy enough to tell you whether it’s lost between the seat cushions of your couch or in the pocket of your raincoat. That’s where the Remote Ring feature comes in handy. You lost your phone while traveling and have no idea whether you left it in a taxi or at airport security. Map Current Location: This feature allows you to track, within the accuracy of the GPS signal, the location of your phone. 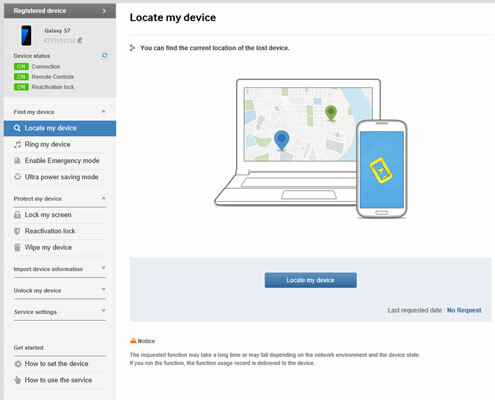 You need access to the website of the company with which you arranged to provide this service, and it will show you (on a map) the rough location of your phone. Here is where having an account with Samsung comes in handy. Hopefully, you signed up for a Samsung Account when you first got your phone. If you did, you are signed up for the Find My Mobile. The figure shows the Find My Mobile PC screen. The Samsung Find My Mobile PC screen. Try these out before you lose your phone the first time.